By now, only on my third review for BBQ Sauce Reviews, I’m startin’ to notice a lot of g’s missin’ in the packagin’. I guess it’s how most of these sauces are marketed – as kinda casual and fun – as the process of grilling and eating BBQ’d foods is inherently fun. Although this Caribbean model uses a similar BBQ sauce industry marketin’ technique, this sauce is a welcome change from a lot of BBQ sauces I’ve tasted. Straight outta the bottle this stuff will spice up your night. I like the hot stuff occasionally, but as a dipping sauce I found the heat to overpower what great flavors that reveal themselves after a solid grillin’. 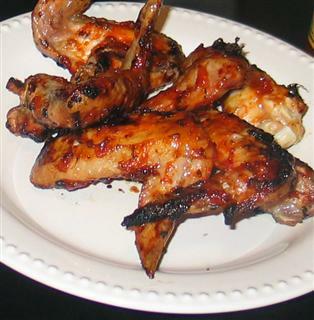 I used chicken wings, but the bottle recommends – in order – fish, seafood, chicken & “Goat”! Kinda funny I guess, but notice the uses of seafood twice in the description. I guess you could put it on crab / lobster and other non-fish seafood, but I think they were really aching to fill some space on the label. That aside, the bottle presents itself as a distinguished Caribbean woman’s pride along with a steel drummer, palm tree leaves, and a boat on the beach in the background. It’s a welcome appetizer for the main course of chicken lathered in this tasty sauce. It went on the chicken without issue, being thick enough to really stick to my wings. Once grilled and settled, the taste was wonderful – a complex blend of mango, spices, and peppers (scotch bonnets are used). There’s heat for those who desire heat, and flavor for everyone else. But is it too hot? No way. There’s a bit of heat, yes, so if you don’t like hot foods you should probaby sit this one out. But it’s not the kind of heat that results in who-can-eat-this-stuff contests. It’s a great mix of heat and flavor – but again, after it’s been grilled. Without the grill, I found the heat a bit overwhelming. Water, Sugar, Mango Chutney (Mango, Sugar, Vinegar, Salt, Ginger, Garlic, Chili, contains sulfates), Tomatoes (Tomato Juice, Citric Acid, Calcium Chloride), Modified Food Starch, Salt, White Vinegar, Scotch Bonnet Peppers, Onions, Jalapeño Peppers ( Jalapeño Peppers, Salt, Calcium Chloride, Acetic Acid), Ginger (contains sulphites), Herbs and spices, Onion Powder, Canola Oil, Garlic Powder, Potassium Sorbate as a preservative, Polysorbate 80. Best sauce to ever face bbqs. I put this on pretty much anything involving chicken and sandwichs, but this sauce makes a burger the greatest tasting burger ever. This is the best tasting sauce I’ve ever had! It is just outstanding. anyone know where i can get more of it? I want to buy a case, it is SO good! I have been trying to get more this sauce since last summer. Waitrose used to sell it. Does anyone know where I can get it from. I sure would like to know where to get this one. It sounds like something I had in St. Lucia last year. Never did find out the nameor recipe. It’s been backstocked, I’m afraid this product is either disco.-ed, or the company had some financial issues. Nothing new in the economy these days. I work at Hannaford Supermarket and I saw that it was being disco.-ed and I bought the 5 bottles that were left in receiving because the shelf got emptied fast when word went around about the disco. No, goat is not a mistake. Goat is commonally eaten in the Caribbean and it is delicious. Usually it is curried but bbq goat sounds delicious! Try Mybrands.com… it’s now called barbados burn. Can order it online! thanks Connie – i will have to try that. This stuff is good!! I got it at Marshals 2 years ago & can’t find it anywhere now. Help. Anyone know where to get this? Well it looks like this one is nowhere to found anymore… a sad day in sauce indeed. im looking for it as well cant find it anywhere….. I love it sooo much !